When Ade Ogundeji was offered a scholarship, he was seen as a long term project with big time potential. Physically he had all of the traits that a program would look for in a defensive end, but he was a raw talent and needed time to physically develop and refine his game. After redshirting his first year on campus and then showing flashes in his second year, Ogundeji finally found his way into the rotation in year three while backing up Khalid Kareem at defensive end. Notre Dame fans started to see that potential rise up to the surface with 3 tackles for loss, one pass deflection, and two forced fumbles last season. One of those TFLs came against Clemson when Ogundeji beat All-American tackle Mitch Hyatt around the edge for a sack on Trevor Lawrence. 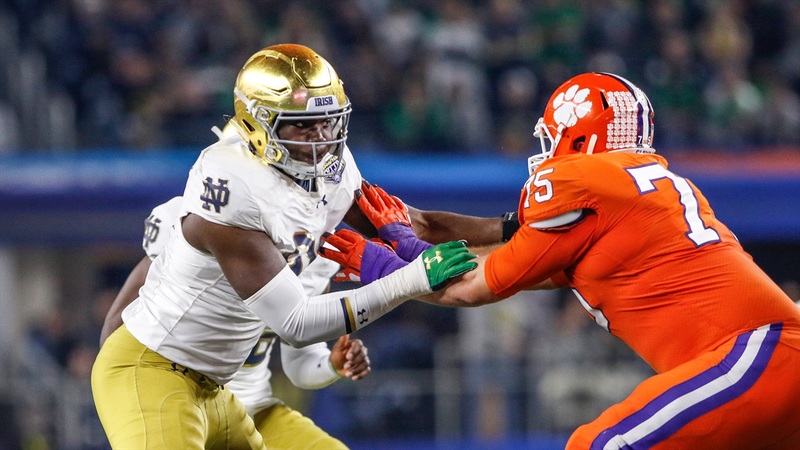 Making a play like that seems like the kind of thing that can boost a player’s confidence heading into the offseason and we’ve seen a confident Ogundeji this spring. On top of that, just playing as much as he did last season was enough to make him feel better about his progression as a player. He’s approaching every one of those reps as a chance to get better and it’s showing on the practice field. While some might view the spring as not being important compared to what happens during the season, Ogundeji knows the details he is working on right now will pay off in the months to come. And, pardon the pun, he’s using these practices as a springboard for what’s to come in the fall. When the Irish went to a 3rd down look on defense last Thursday, Ogundeji was on the field disrupting the offense. He even came up with a strip sack to put an exclamation point on a dominant series of plays from the Notre Dame defensive line. That performance reiterated to everyone in attendance the kind of talent the Irish have up front and just how good they can be again in 2019. It helps that the Irish are so deep at Ogundeji’s position. For the first time in years, there is an overflow of capable defensive ends on the roster. Ogundeji could start for many programs, but at Notre Dame he is backing up Kareem. That’s fine with Ogundeji and the rest of the group because they do a great job of pushing each other on the field while being happy for the overall success of the team. Although the defense has lost some key players, it hasn’t changed the outlook for Ogundeji and the rest of his teammates. What they accomplished last season has only motivated them further to take the next step. He knows it’s going to take the full focus of everyone on the defense, but that they have the personnel that can help Notre Dame win a championship. “We can be the best defense in the country and I thoroughly believe that,” Ogundeji said. “I believe we can win the national championship with this defense. I truly believe that.